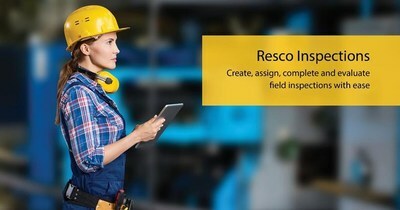 Resco, the leading provider of enterprise mobile solutions for Microsoft Dynamics 365 and Salesforce, has announced the upcoming commercial launch of its anticipatedÂ Resco Inspections . After being available to Resco partners and customers upon request throughout 2018, Resco Inspections will be officially released as a standalone product on January 22, 2019. Resco Inspections enables organizations to create comprehensive dynamic questionnaires and forms with entirely customized design and business logic to drive each inspection. It also makes inspections more effective for the field staff, guiding them through questionnaires step-by-step. And allows to analyze collected data immediately afterwards. Consisting of dedicated Designer, Scheduler, Inspector and Analytics applications, Resco Inspections handles the entire process of creating, assigning, completing and evaluating field inspections. Whether it is service technicians going through checks of complex machinery, or insurance agents assessing property damage after a flood. The solution is fully functional even offline and can be also connected to external data sources. This enables questionnaires to load and utilize data from various enterprise systems, including Microsoft Dynamics 365, Salesforce, and many others. Detailed solution overview together with complete licensing and pricing options forÂ Resco InspectionsÂ will be also revealed during the official release on January 22, 2019. Resco, founded in 1999, is one of the global leaders in developing cross-platform mobile software solutions. The team of Resco professionals utilizes their knowledge to design products for corporate customers, developers, integrators, and end users. Today, Resco is utilized by 2 200+ corporate customers with more than 150 000 licensed users around the world and specializes primarily in Mobile Application Development Platforms, Mobile Sales, Field Service, Inspections, Route Planning, and City Smart Services.